My husband’s last words made me ponder something. Waiting and be patient. Two things that are often become serious problems in our life. These two things are closely related. When we must be waiting, it means we have to be patient. Whatever we wait, there must be an element of patience. For simple examples, when we were waiting for the queue to meet our doctor, we have to be patient. When we had to queue up buying cinema tickets, we also have to be patient. Or things that more important and serious in life such as a marriage couple waiting for their baby or we are waiting for the God’s help of our problems. It all needs patience. The problem is we often so hard to be patient in waiting. Moreover when we faced very big problems and hard time, it will be so difficult to waiting with full of patience. Yes! Actually God never neglect. He never forgets to fulfill His promises. Yet we have to realize and really comprehend that God’s time is not the same as our time. I really know that it is not easy to be patient in the midst of hard pressure. But if God has been promise the best for us, we supposed to do not worry and fully trust that God will fulfill His promises. In the time of waiting we actually could experience the process of establishing ourselves in order to become a stronger person, more resilient, more mature and in the difficult time we can train ourselves to learn to rely on and fully trust to God. “For my thoughts are not your thoughts, neither are your ways my ways, “declares the Lord. God has another better plan for us and as I have mentioned before, God’s plan is always good and beautiful more than our plan. Remain be patient. Sometimes the desires of our heart need time. They do not happen overnight. Please do not treat God such as a vending machine when once we insert the coin, choose what we want, and then we can get what we want very soon. For how long we should be patient in waiting? 25 years like abraham was waiting for his child? More than 40 years like the Israelistes entering the promised land? More than 2 years like I was praying for my husband accept God as his personal savior? Same with my husband answer, we even do not know for how long. The timing of God’s answer is a mystery. Only God knows when the time our prayer would be answered. We do not have the ability to unveil the secrets of the Divine like the secret of unfolding my rose flowers. God’s timetable is not our timetable but He promises that everything will be beautiful in His time. Keep trust to God. We have to trust that God will answer all of our requests, and we will not be waiting n vain. We have to trust that God is almighty who can do things seemingly impossible for us but all things are possible before God. We have to trust in God for His leading and guidance in every of our step. As the rose flower, when the time comes, He will unfold the rose. And it will be holds true with our life, when the time comes He will fulfill His promises , will answer every of our prayers, and finally our long waiting and patience will be not in vain. Amen. With these clumsy hands of mine. Is not known to such as I. When in my hands they fade and die. To unfold this life of mine? each moment of every day. each step of the pilgrim way. Only my Heavenly Father knows. 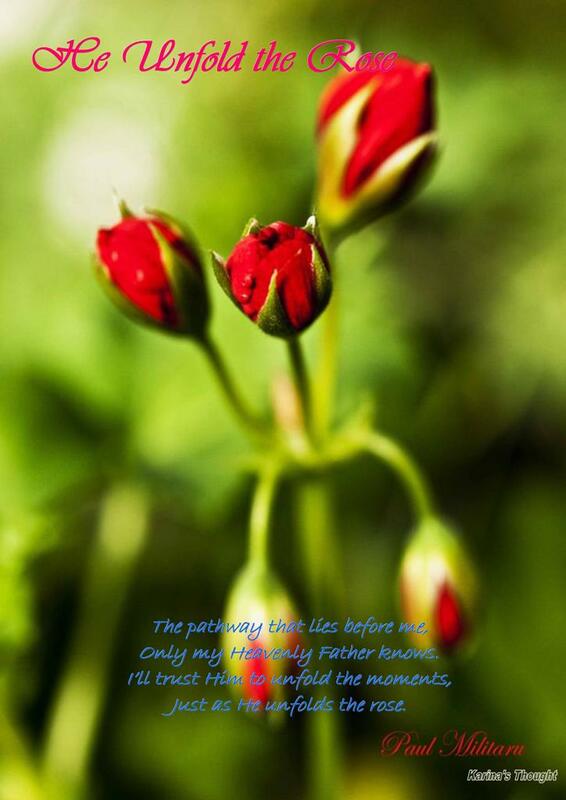 Just as He unfolds the rose. My beloved friends, in our life we always want to something new. Why do we always read the newspaper every morning, watching news on television or searching through internet? Because we always want to know the latest news and what is become a trending topic today. When we go to the bakery, we always look for the new and fresh bread. We all always love something new. 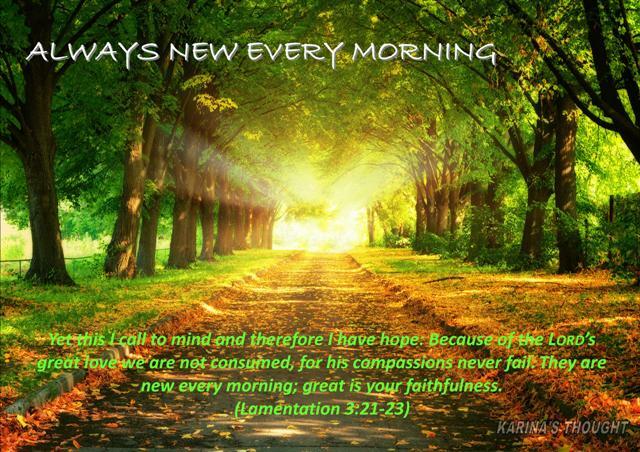 God knows it, and behold that He promised new blessings every morning. What do we think about when we wake up every morning? Whether we instantly think of our fully work schedule today? Griping and thinking about our unresolved problems? Or we are preoccupied with so many things so we forget to give thanks for the God’s blessings this morning? Would be a pity if we wake up every morning besides thinking about our busyness, we do not think and feel God’s grace and blessings that always new every morning. every morning? Yes! God’s word said every morning. This means there is grace from God poured out down when we are wanted to start a new day. Look how beautiful we living with God. Once we wake up, there is God’s grace that instantly greets us. He longs to bless us with all the best that comes from Him alone. That is God’s promise. But unfortunately we may not be aware of and missed all of that because we tend to start a new day with the thinking about a stack of problems, our mind full of restlessness, grumbling and so on. The writer who wrote this verse really knows where he should direct his focus. He fully realizes that God’s faithfulness was not limited and so great for us. God’s grace is so, is endless, and always new every morning. Not only grace and blessings but God always gives us a new hope so we should not hesitate to put our hope in Him. And there are many more God’s promises in the following verses. If the verses above still less convincing us, let we open one passage the book of Isaiah, it was clearly written which states that those who hope in the Lord will renew their strength. They, or we, would like an eagle flying overcome the storm with a strong pair of wings, will not even easily tired despite facing severe storms. Romans 8:32 also show how precious we are in His eyes. How great His love to us. How great God’s yearning to always provide the best to us. He who did not spare his own Son, but gave him up for us all—how will he not also, along with him, graciously give us all things? My beloved friends, what about our morning today? How we treat our beautiful morning? If we woke up then our mind has been filled with every kind of life problems? Filled with disquiet because there are so many unsolved tasks? Or we spend time a while just sitting on the bed and be grateful through prayer for the opportunity sipping the fresh morning air, give thanks to the breath of life that God has given to us, enjoying the warmth of the morning sun, be grateful we still have a chance to listening a beautiful songbird and said to God, “Dear Lord in heaven, thank you for this beautiful morning. Thank you for the opportunity to live and feel how beautiful and great is Your love”? Right now, allow me to encourage you to always make sure ourselves to remember all of this every morning, and give thanks to all God’s goodness when we woke up. Keep reminding our soul and mind to realize how good God is, never forget the grace which He lavished on us, never forget a new grace that He bestowed to us as a tremendous grace to us. Keep Preserve so that we will be able to continue to grow with an increasingly strong faith. It is good to know what God’s blessings are, but please do not just to know, Let’s continue to give thanks every day and make sure we feel His goodness, and pay attention it all in order to be real and alive in us. By taking a few moments to give thanks, will make us more aware that God is always present in our lives with the grace which is always new every morning and His compassions never fail even in the midst of difficulties we face there is always grace and hope because He is ruling above of all forever and ever. Amen.